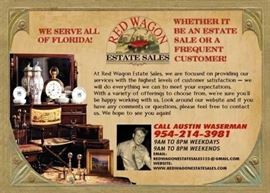 AddressThis sale in Fort Lauderdale, FL 33304 is a "By Appointment" sale. Please see sale info below for details. ETC. YOUR ITEMS!!! NO LARGE BAGS!!! IF LARGE CROWD, NUMBERS WILL BE HANDED OUT. WE RESERVE THE RIGHT TO LET 10 PEOPLE AT A TIME INTO THE SALE FOR YOUR SAFETY. WE ARE NOT RESPONSIBLE FOR ANY INJURIES!!! ALL ITEMS PURCHASED MUST BE PICKED UP BY CLOSING OF LAST DAY OF SALE OR YOU FORFEIT PAYMENT AND ITEM!!! NO REFUNDS OR EXCHANGES!!! ALL SALES ARE FINAL!!! Estate sale by appointment in Fort Lauderdale condo. Mid century Atomic furniture, Art Deco furniture, kitchen items, costume jewelry etc.